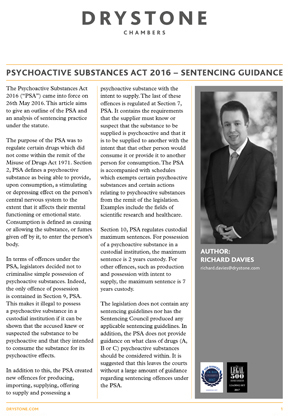 In the following article Richard Davies explores the Psychoactive Substances Act 2016, outlining the purpose of the Act and providing some analysis of sentencing practice under the stature. He explores relevant case law that might provide guidance for the busy practitioner, explaining where the Act doesn’t provide clear guidance and therefore where caution might be needed. He goes on to describe two recent cases that provide some evidence and warning as to possible early inconsistencies in the current sentencing approach.